Who doesn’t love ordering crispy orange chicken? Forget the restaurant. Now you can stay in and make it yourself at home. Rest assured that this meal is filled with healthy ingredients that will not derail your fitness results. Combine the orange juice concentrate, coconut aminos, olive oil, orange zest, red pepper flakes and Stevia in a small bowl. Mix well and set aside. In a large skillet, heat the coconut oil on medium-high. Generously season the chicken pieces with salt, pepper and granulated onion. Add chicken to hot skillet and brown on all sides. 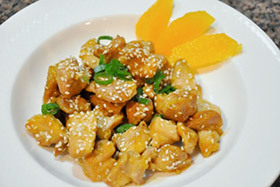 When chicken is almost fully cooked, add the orange sauce, stirring to coat all of the chicken. Cook, uncovered, simmering the sauce until thickened and fully sticking to the chicken. Garnish with sesame seeds and freshly chopped green onion.